In a pot, prepare the syrup mixing 3 cups of sugar and 3 cups of water. Bring to a boil. Then turn the heat off and let it cool. Melt the butter and pour all over the shredded dough. Mix it using your hands and make sure they get mixed up well. Meanwhile, split the shredded dough into small pieces by pulling them apart with your fingers. Grease a middle size oven tray or Pyrex. Then, spread half of the shredded dough and press down using your hands. Slice unsalted cecil cheese or Mozzarella (about ¼ inch thick). Place sliced cheese over the shredded dough evenly and then, cover with the remaining half of the shredded dough. Again press down to compress using your hands. 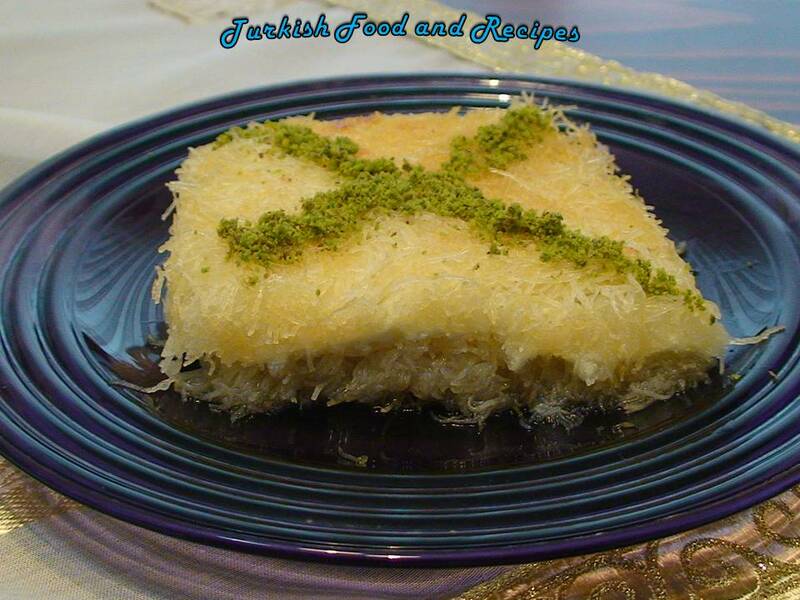 Preheat the oven to 400 F (200 C) and bake Kunefe until the top turns light brown. Then, take it out of the oven and turn upside down with the help of a flat tray. Again bake until the other side turns light brown. Pour the cooled syrup all over the hot Kunefe and set aside for 5-7 minutes before serving. 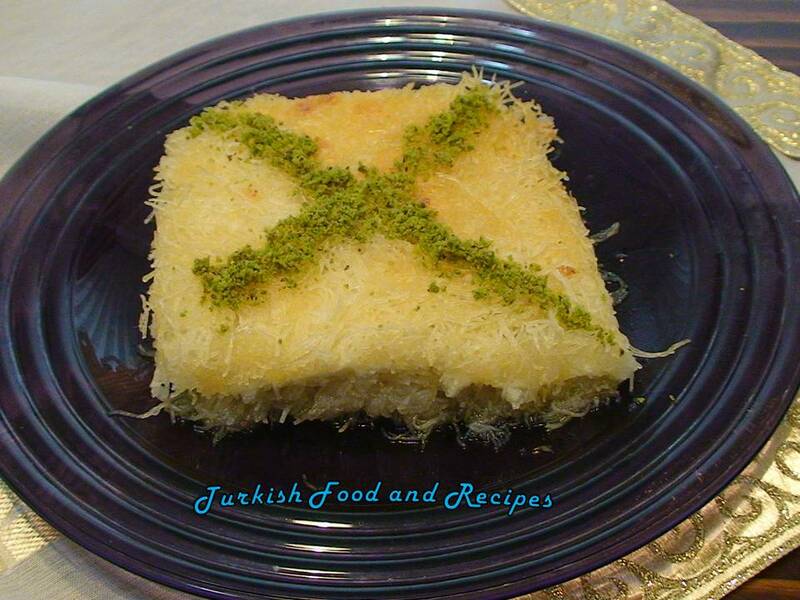 After the syrup is absorbed slice the Kunefe as you like and garnish with ground pistachio. Bir tencerede, 3 su bardagi seker ve suyu kaynatin, sogumaya birakin. Tereyagini eritin ve tel kadayifin uzerinde gezdirin. Elinizi kullanarak tereyaginin kadayif icinde guzelce karismasini saglayin. Bu sirada, elinizle tel kadayiflari cekerek mumkun oldugunca kucuk parcalara bolun. Orta boy bir tepsiyi yaglayin ve tel kadayifin yarisini tepsinin dibine doseyin. Elinizle ustten bastirarak tel kadayiflari iyice sikistirin. Dilimlediginiz tuzsuz cecil peynirini (yaklasik ½ cm kalinliginda) tepsideki tel kadayifin uzerine esit sekilde doseyin. Son olarak tel kadayifin diger yarisini peynirlerin uzerine yayin ve yine uzerinden elinizle bastirarak sikistirin. Onceden isitilmis 200 C (400 F) firinda uzeri kizarana dek pisirin. Uzeri kizardiktan sonra firindan cikarin ve duz bir tepsi yardimiyla kunefeyi alt ust edin. Tekrar firina verin ve ters cevirdiginiz yuzu de kizarana dek pisirin. Firindan cikardiginiz sicak kunefenin uzerine soguk serbeti gezdirerek dokun. Yaklasik 5-7 dakika sonra suyunu cekecektir. Istediginiz sekilde dilimleyin ve uzerine cekilmis antep fistigi serperek servis yapin. Künefe en sevdiğim tatlılardan biridir. Ellerinize sağlık. Cok Guzel......Thank you for posting this recipe for 'kunefe'.......My husband loves Kunefe and is from Izmir, but we live in Canada and it is hard to find any bakery to buy it, so now I will make it for him Thanks again. Çok guzel! Your blog is wonderful and I am posting it in my links. I blog about Turkey because I used to live in Mersin and my husband is from there. carolynsnowabiad dot com. Tomorrow's post is about meze. Ellerinize saglik Hayriye hn, ancak bu cecil peynirini Amerika ne isim altinda bulabiriz. Oglumun en cok sevdigi bir tatli oldugu icin denemek isterim. Thank you for this recipe. I will bake it! This is so delicious!